I finally bit the bullet and started playing Hearthstone when it was released on iPad, and I've been staring at that buy button for weeks now. 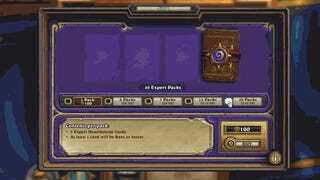 So let's figure out if there's anything worth buying in 40 packs of Hearthstone cards. Note that this is still a fairly small sample size, so these numbers aren't going to be super accurate, but they can give you an idea of each type of card's rarity. The one legendary card we got was Baron Geddon, who is perhaps not the most exciting. We also got over 1600 dust just from disenchanting dupes, golden cards, and a couple of epics I knew I wasn't going to use, so that's enough to craft a new legendary when I decide on one I want, or a bunch of rares and epics. Several people did similar tests with larger sample sizes during the game's beta, but since the drop rates aren't public Blizzard could change them at any time, so that data may be outdated. That said, here's a guy who opened 360 packs ($450), and a reddit thread based on opening 206 packs. Have you spent any money in Hearthstone or other free-to-play games? Was it worth it, or did you regret it?